There will be no casual observation of the blissfully soft feel of the Fruit of the Loom SF72R 7.2 oz. Sofspun Crewneck Sweatshirt. It will envelope you with the warmth and comfort of lightweight fleece, which is ideal for layering or wearing alone. 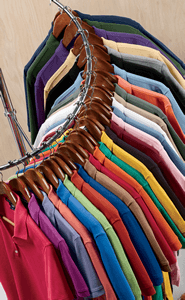 Natural, breathable cotton is balanced by the rugged durability of color-retaining polyester in this premium 60/40 blend. Rebounding spandex construction on the 1x1 rib collar transitions smoothly into the v-notch detail and tear away label. Double-needle coverstitching on the spandex waistband, collar and armholes adds strength to these points of wear. Contrasting neck tape covers the raw edge of the sewing construction and lends additional reinforcement. The concealed seams on the cuffs and waistband also resist wear, and are strong and resist fraying as the raw edges of the fabric are hidden inside. While this garment has the look of a classic sweatshirt, the superior softness makes it unforgettable.